Pop quiz time! What’s better than an iPhone case? 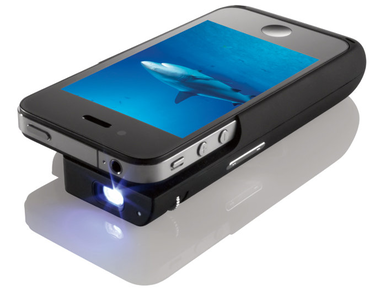 An iPhone case with a built-in projector, correct! What could possibly be any better than a handy way to protect your iPhone from all the scuffs and scrapes of a busy day and being able to show that Keynote presentation at the same time? Texas Instruments and hardware company Brookstone have teamed up to offer just that. As if a built-on projector wasn’t enough, the case even doubles up, or should that be triples up as a battery back as well, adding a 2100mAh battery to an already impressive package. The case plays host to a Pico projector, which is capable of projecting an image up to 50-inches in size at a resolution of 640×360. Yes it isn’t a massive number of pixels, but did you miss the part about this being part of a case?! 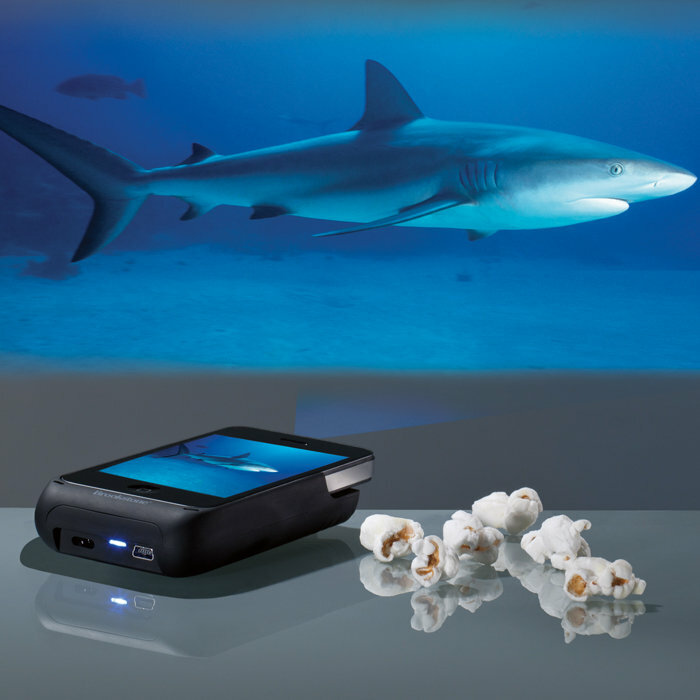 Our Pocket Projector for iPhone 4 is perfect for on-the-go travel entertainment. Its super-bright 15-lumen LED projector lamp ensures clearer, more brilliant images than other pico projectors. 640×360 native display resolution projects up to 50" images. In order to get your hands on the Pocket Projector for iPhone, you’ll need to stump up the considerable cost of $230, though it has to be worth a lot more than that in sheer coolness points! The projector-case-awesome box will begin shipping next week. That 50-inch image will need about 8 feet of empty space dead straight in order to work as well as possible, according to Macworld’s Dan Frakes, who was lucky enough to spend some time with the little wonder. According to Frakes, the images produced by the built-in projector are actually quite good, although a dark room is required to make the best use of its super-tiny DLP Pico chip. If you’re the kind of person that carries around a small projector anyway, or would just make real use of the ability to throw video or images onto a wall straight from an iPhone, then the $230 might not seem so steep after all. Whether you need one or not, just owning something that can be used do project images from an iPhone via an all-in-one solution like this would certainly earn you some massive geek points with those of us who like that sort of thing.